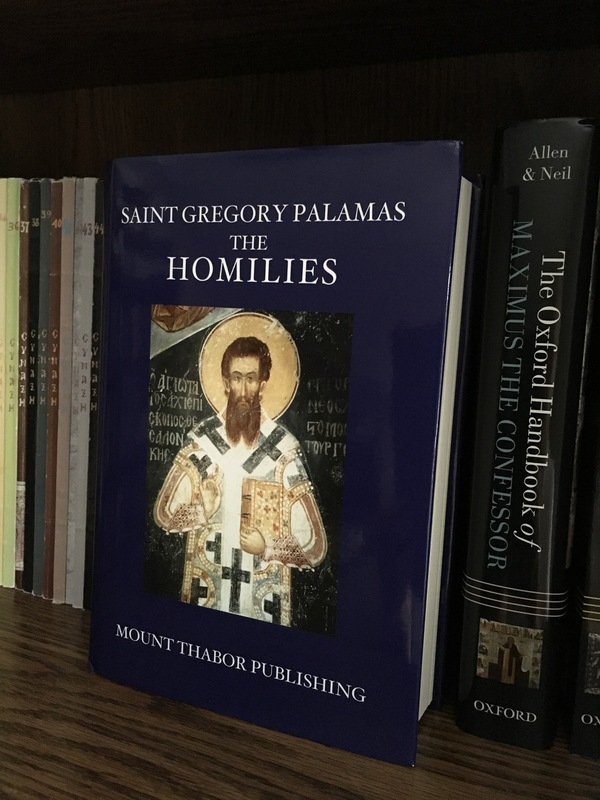 Saint Gregory Palamas is one of the most revered theologians of the church. He lived about 700 years ago in northern Greece. He explored some profound theological ideas which created quite a bit of controversy – and still do. His main concern was to show how God interacts with us, how God enters our lives, how God communicates with us and makes himself known by us. That was, of course, the great challenge for the two disciples walking to Emmaus: how were they to know that it was Christ who joined them on the road? The initiative came from Jesus himself. And the initiative always comes from God, according to Gregory Palamas. We live in an age where theological thought is almost non-existent in church circles. Serious theology has been replaced by simple-minded slogans and the marketing of the faith. Even sermons are expected to be short and practical. If Jesus really was the Son of God and if his death had consequences for all human beings, then it is not something that should be turned into a slogan or a marketing campaign or a 10-minute feel good sermon. The two disciples walking to Emmaus were confused; they couldn’t understand how their friend and teacher could die on the cross. They thought he was the Messiah; he had come to deliver the people from Roman oppression. How could he have died, humiliated on the cross? Jesus could have taken the easy approach – the marketing approach – and simply revealed himself on the road, to relieve them of their sadness. “Hey guys, it’s me. I rose from the dead. All’s well.” No, he said nothing of the sort. While walking, he opened to them the scriptures. He got into serious exegesis, serious theology. Then he sat to eat with them and broke the bread, blessed it and gave it to them. And their eyes were opened. And he disappeared the minute they recognised him! No speech about being risen. He gave them the theology of words; and then he gave them the theology of bread and vision. And that was it. He wanted them to go back to Jerusalem; and there he would again reveal himself to all the gathered disciples. He wanted his community to be together before he would reveal himself in the fulness of his resurrection. Walking is movement. And the Christian life must be a life of movement and growth – it must be! Think about the ancient Greeks. There was even a school of philosophy called the peripatetic school. It was Aristotle’s school, and it got its name because Aristotle and his students walked while he lectured. The people of Athens called Aristotle’s school the Peripatos! And before Aristotle, Socrates loved to walk while engaging in his many conversations that were preserved in the Dialogues of Plato. Many of the dialogues of Plato have vivid descriptions of the surroundings where Socrates and his conversation partners walked or met. Down through the ages, walking has been the muse that inspired many geniuses. Beethoven loved to walk in the nature that surrounded the city of Vienna. And it was in these walks that he was inspired to write his 6th Symphony, the Pastorale, a symphony filled with the sounds of nature. Even great scientists like Einstein were often photographed walking. One of my favourite philosophers is Søren Kierkegaard. He lived in Denmark in the first half of the 19th century. He was notorious for walking the streets of Copenhagen and talking to strangers wherever he went. Kierkegaard was very critical about life in Denmark, so people were puzzled that he loved to walk and talk with complete strangers. They imagined that he would rather stay home by himself. But he walked and talked hours on end. 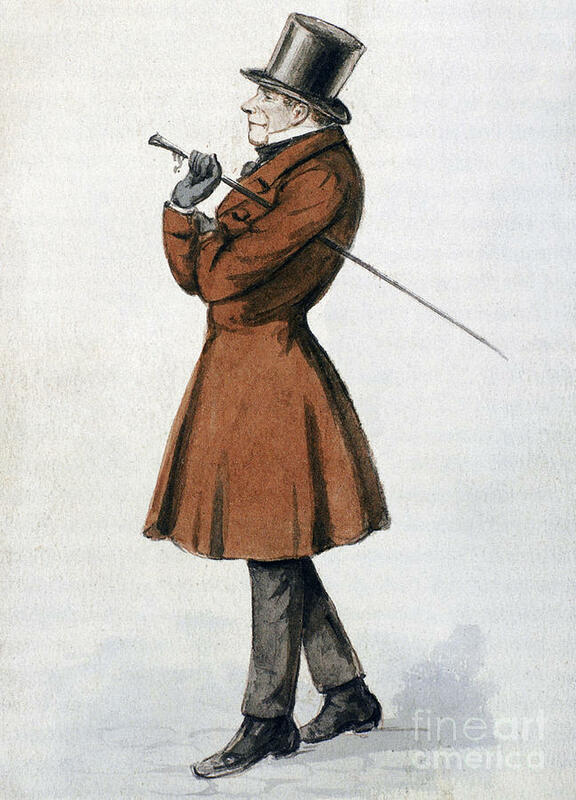 Many caricatures drawn by his contemporaries show him walking. [Every] day I walk myself into a state of well-being and walk away from every illness; I have walked myself into my best thoughts, and I know of no thought so burdensome that one can not walk away from it. . . . [By] sitting still, and the more one sits still, the closer one comes to feeling ill. Health and salvation can only be found in motion. . . . If one just keeps on walking, everything will be all right. On many of his walks, he encountered people who ridiculed and criticised him for what he wrote. But this did not stop him from walking, or writing. He wrote against “sissy, effeminate” Christianity. Christians should “insist on getting out into the streets, among men, where there is danger and opposition.” The Christian goal, after all, is to become “a thorn in the eye of the world”. 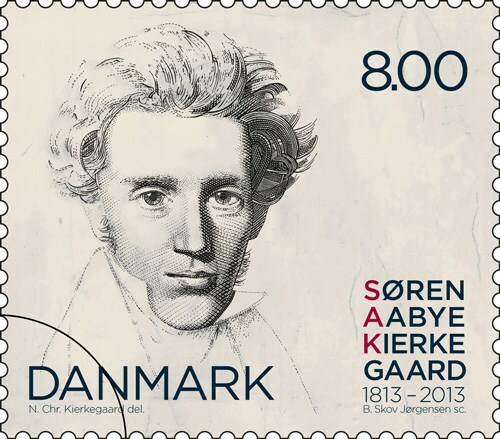 Walking the streets of Copenhagen was important to Kierkegaard because it helped him clarify the Christian faith. He went so far as to say that preaching should not be done inside churches, but out on the street, right in the middle of life. And that last phrase, dear friends, is the key – in the middle of life. In the middle of life where Dante also met Vergil and the two began their walk through Inferno, Purgatorio and Paradiso – the three books that make up Dante’s masterpiece, The Divine Comedy. We are always in the middle of life; in the middle of our walk to Emmaus, to the resurrection, to the union with God that Gregory Palamas labored to explain. We are always in the middle; and that’s where Jesus comes and walks with us. No matter how old or how young you are, the middle is the place of growth. Don’t settle for less. Categories: Sermons | Tags: Gregory Palamas, Soren Kierkegaard, theology of bread, theology of words, walking | Permalink. 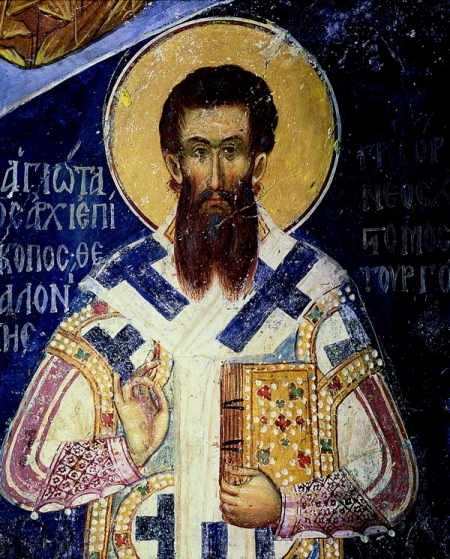 In 1334 Saint Gregory Palamas experienced a vision. In the vision he was carrying a vessel overflowing with milk, but the milk then turned into the finest wine. A youth appeared and rebuked Gregory for not sharing the wine with others and reminded him of the parable of the talents (cf. Matt. 25:14–30). Palamas interpreted the vision to mean that he should go from teaching simple moralistic messages (the milk) to the higher truths of faith (the wine). In seminary classes with Fr. John Meyendorff I studied the theological writings of Gregory Palamas. But now, some 34 years later, I’m becoming familiar with his homilies and they’re better than his theological writings. There is a homily by Gregory Palamas for this Third Sunday of Luke which, in my opinion, perfectly represents the lesson he learned from the vision. Indeed, my mouth dropped as I read this homily. Gregory Palamas is as fine a biblical preacher as I have ever encountered. Gregory saw the miracle of the widow’s son as a parable of spiritual renewal. But it’s a renewal reserved for the “last times” – in other words, our times. The “last times” is biblical language for the manifestation of Christ in glory. It’s not only a reference to the Second Coming. Palamas lived in the “last times” as we also live in the “last times”! Gregory does not hesitate to see in this miracle an image of God’s creation of the universe from nothing. This is no ordinary miracle that can be preached in a superficial 5-minute sermon. Nothing Jesus ever did was ordinary, and to reduce the Gospel stories to trivial feel-good messages is to do a great injustice. Gregory learned from his vision not to do that. Telling us to be compassionate sounds like the usual moralistic message preached by countless preachers. But no, this is not milk, this is the finest wine. 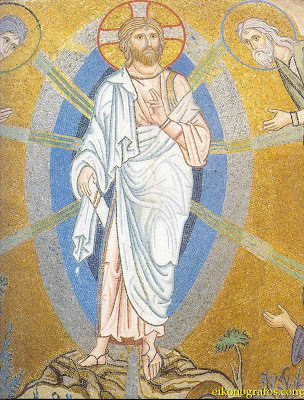 Because Gregory says something truly profound: “For by our very nature we are bound to be compassionate and merciful one to another.” Gregory is fully aware of sin – but he is also aware that within every one of us is the original beauty – the original goodness – that God planted in us. By nature we can be compassionate and merciful to one another. Gregory presents this as self-evident, something not to be disputed or even proven! It should be self-evident to every Orthodox Christian. But we also need the reminder and the challenge: Can we live and act in harmony with the beauty that God has placed in us? By the intercessions of the Myrrhstreamer among martyrs, may we too, who share in the holy myrrh that flows from him, also see and partake then of that glory, by the grace and love for humankind of Jesus Christ, who is glorified in His martyrs and is God over all, to whom belongs all glory for unending ages. Amen. Categories: Sermons | Tags: compassion, Gregory Palamas, original goodness, Resurrection, widow of Nain | Permalink. I usually don’t quote extensively from the Fathers, because I prefer to speak with my own voice. But today’s Gospel reading (Luke 6:31-36) prompts me to share some powerful messages from Saints Gregory Palamas and Isaac of Syria. St. Gregory tells us that this Gospel reading aims at making us like God. Indeed, Be merciful, even as your Father is merciful. Then the light of the glory of the Most High will shine around you, and you will be among those who in the company of Christ will be deified. It is the heart’s burning for the sake of the entire creation, for men, for birds, for animals, for demons, and for every created thing; and at the recollection and sight of them, the eyes of a merciful man pour forth abundant tears. From the strong and vehement mercy that grips his heart and from his great compassion, his heart is humbled and he cannot bear to hear or to see any injury or slight sorrow in creation. For this reason he offers up prayers with tears continually even for irrational beasts, for the enemies of the truth, and for those who harm him, that they be protected and receive mercy…. But the sum of all is that God the Lord surrendered his own Son to death on the Cross for the fervent love of creation. This is not because he could not have redeemed us another way, but so that his surpassing love might be a teacher to us. And by the death of his Son he made us near to himself. So great was his love for us that he did not wish to violate our freedom, but he chose that we should draw near to him by the love of our understanding. This, dear friends, is what is missing in so much of Christianity today. St. Gregory is right to identify this Gospel reading as the sum of all Christ’s teaching. If we can give without expecting anything in return; if we can love even our enemies – then we are perfect, and the fullness of God’s image and likeness is in us. Luke says, Be merciful as your Father is merciful. Matthew 5:48 puts it differently: Be perfect as your Father in heaven is perfect. Our liturgy is full of Kyrie Eleison – Lord have mercy. But where is our call to be merciful? Is it the missing dimensions in our lives? The hatred and bigotry that are so much a part of Christian societies today are the exact opposite of what Christ teaches. There are too many walls in the world – because there are too many walls in our own minds and hearts. What I love about Gregory’s teaching is that he uses the word “re-making”. Because of Jesus Christ, God is re-making us. We are a work in progress. Jesus tells us today that because he is re-making us, it will be natural for us to love even our enemies, to even pray for the devil (according to St. Isaac). Most of us are not there yet. But let us strive to it. Let us not move backward – backward to the state of sin, backward to what we would be without Christ. Watch your speech, watch your thoughts. Let love govern your speech and actions. 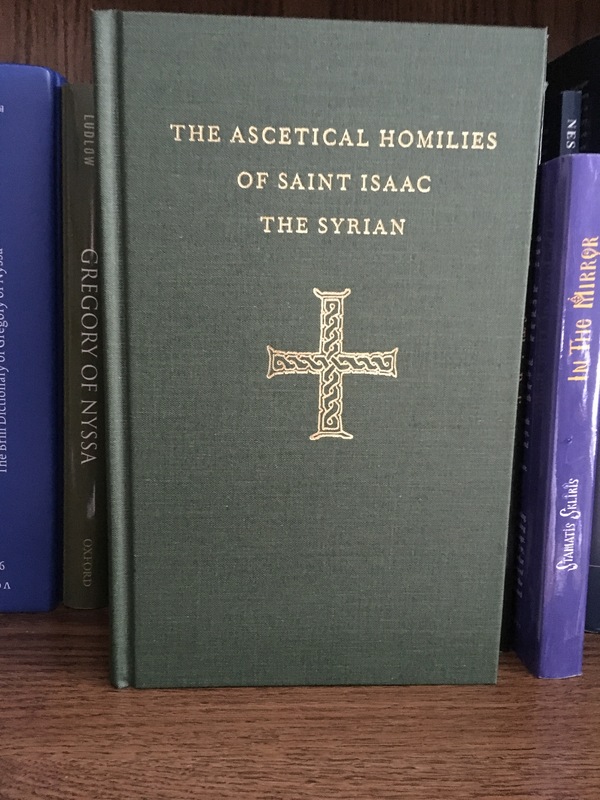 St. Isaac (Hom. 46) tells us, Paradise is the love of God. The tree of life is the love of God. If we live by love, we partake of Christ and are made immortal. The person who lives in love reaps life from God, and while still in this world nevertheless breathes the air of resurrection. Love is the language of the kingdom. There is no other language that can be spoken in the eternal kingdom of God. When you travel to another country it helps to learn something of the language spoken there. So why don’t we start learning the language here? Why not start speaking it and practicing it? Love your enemies. Be perfect as your Father in heaven is perfect. Categories: Sermons | Tags: be perfect, deified, Gregory Palamas, Isaac of Syria, language of heaven, love, love of enemies | Permalink. The second in a short series of Bible Study classes exploring the themes of the Sundays of Lent focused on St. Gregory Palamas, who is commemorated on the Second Sunday of Lent in the Orthodox Church (last Sunday, March 8th). Palamas is most associated with the Orthodox doctrines of deification and the distinction of essence and energies. An audio file of the class is attached, together with a PDF version of the PowerPoint presentation. The files of the class are presented here primarily for the benefit of class participants. But others are welcome to listen to the audio and view the PowerPoint slides in the PDF version attached. To access the PDF version of the PowerPoint presentation click on the link below. It should be viewed in conjunction with the audio file. Categories: Evening Classes | Tags: Deification, Gregory Palamas | Permalink. By their attitude, the scribes in today’s Gospel reading, Mark 2:1-12, are preventing God’s word from acting as a force that sets men free. The man’s stretcher makes me think of the many who are crippled because of the absence of love. Lying there and unable to rise are those who are without hope, who are imprisoned within their own loneliness, and whose hearts are dry and withered. That was the situation of the man by the pool (John 5:2-9). It is the condition of millions in our world today! Thank God the man in today’s reading had four friends who loved him, because almost everything around him was loveless. Jesus himself would find himself abandoned of love when his time of trial and crucifixion came. The ancient world is not very different from our modern world. But today too there is love to be found, here and there. I saw a wonderful report yesterday on BBC World News about a new fight against cancer in a British hospital using targeted, individually tailored medicines and treatments based on a person’s DNA and immune system. Some of the patients featured died, others are still living. But what struck me is the hope that radiated in this hospital, from every doctor and nurse and on every patient’s face. Yes, it is “strange” when healing is more than simply medicinal, more than simply a matter of physical recovery. The deeper healing is in the faces of patient and doctor. 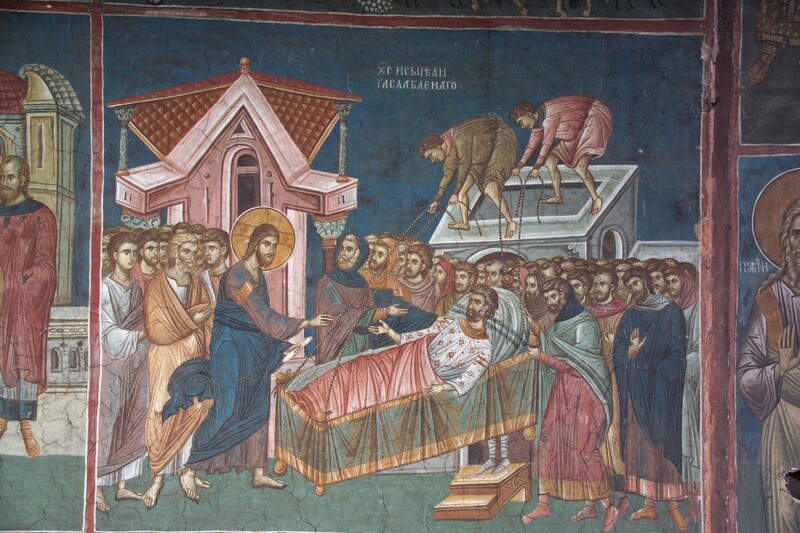 Jesus looked at the face of this paralytic and the faces of his friends, and went to that deeper level of healing. Sometimes that’s all the healing that can take place. It’s true, only God can forgive sins. But how did God choose to do it? Not through sacrifices of animals, not through imposition of self-punishment on people. God did it by becoming one of of us. Only God can forgive sins, but God becomes man in order to do it. Thus Matthew’s version is on the mark: they glorified God who had given such authority to men. Instead of placing burdens and road blocks on each other – as the scribes and the Pharisees were doing and still do today in churches! – we are given authority to heal and to lift burdens. That is our calling. Jesus is the pioneer and perfecter of our faith, as we heard last week (Hebrews 12:2). 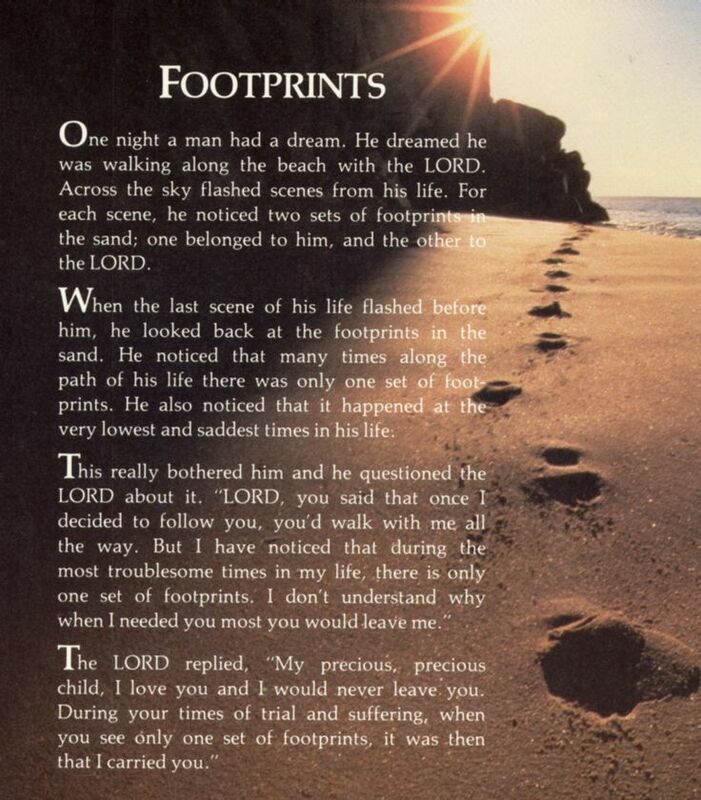 He has gone ahead of us and calls us to follow. He promised that we would do even greater things than he did (John 14:12). One of those greater things is to make room for the unexpected. I hope our worship is not like the house in today’s reading: closed to the outside. We’re not packed with people, there’s plenty of room – unlike the house in which Jesus was preaching – and yet it could still be true that there’s no spiritual room, no opening to the outside. Are we a church where people are touched deep in their inner core? Are we a church of rules, or a church that enables people to touch God? This is why today we honor St. Gregory Palamas, who lived about 700 years ago in northern Greece. His theological insights are difficult to explain in a sermon. But the purpose of his complicated language was actually quite simple: his primary aim was to insist that human beings can experience God’s presence really and fully in their lives. And furthermore, it is possible for human beings to be filled with divine glory, the same glory that shone from Christ on the mountain. I don’t know about glory and divine light. But I do know that we can be messengers of peace and healing. Let us be such a church. 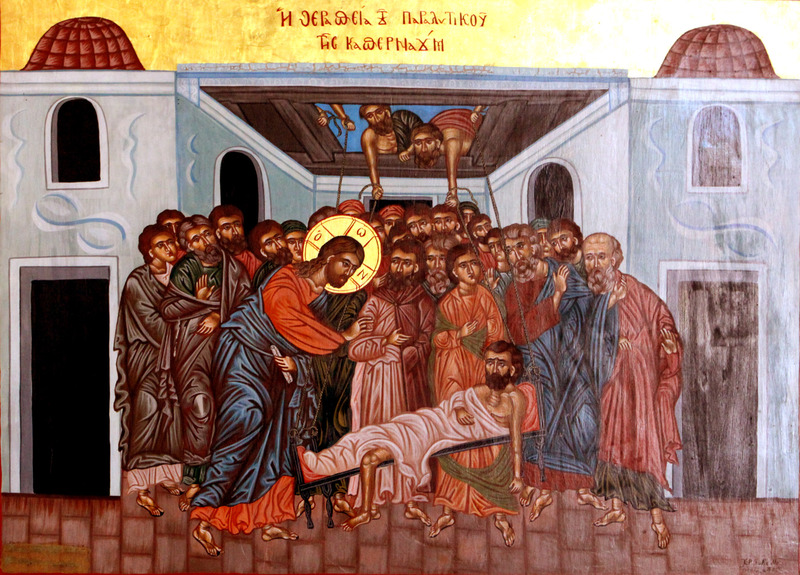 Categories: Sermons | Tags: BBC documentary, Gregory Palamas, new cancer treatments, paralytic lowered through roof, Second Sunday of Lent, spiritual openness | Permalink.